When you wake up in the morning, what story do you tell yourself about the purpose of your work? Not that? What about aiming to achieve a departmental goal, like “Increase site traffic by 30% compared to this quarter last year”? I imagine it’s not that either. You probably joined the company for a more aspirational reason. Maybe you support the company’s mission. Or you want to work for a brilliant leader in your field. The metrics are just a way to measure your progress towards achieving that goal. They are not the goal itself. This is where OKRs, or Objectives and Key Results, become useful. When your company talks about quarterly or annual goals, the OKR system enables every employee to connect with the overall mission so they don’t lose interest after hearing about boring metrics over and over again. Or, even worse, they could forget their purpose because there are no goals at all. OKRs were created by Andy Grove, the famous CEO of Intel. They started to gain popularity in 1999, when John Doerr, a venture capitalist, helped Google implement OKRs to manage a rapidly scaling team. In both cases, the company leadership needed a way to communicate goals and make it clear how each department could contribute. Leaders need “every person rowing in the same direction”… or every vector pointing in the same direction, if you prefer the diagram above. If each department formed their own goals, then all employees would be handicapped by the lack of alignment. Employees would be disappointed when they failed to accomplish their personal goals. Here’s how to start using OKRs at your company. Objectives and Key Results bind an audacious goal to a series of actionable steps. Every level of the organization can create one–from management to teams to individual contributors. Generally, no team or individual should have more than 5 total objectives and 5 key results for each objective. An individual should have closer to 1-2 objectives, while an entire department might have 5 objectives. An objective is a qualitative, ambitious goal that will be challenging to accomplish. The key results are the steps that need to be taken to hit that goal, and they are always quantitative. The key results are hypothesized steps that will lead to the accomplishment of the objective. Since the objective is qualitative and can’t be measured, you can’t guarantee that the results will help you accomplish the objective by the end of the quarter. 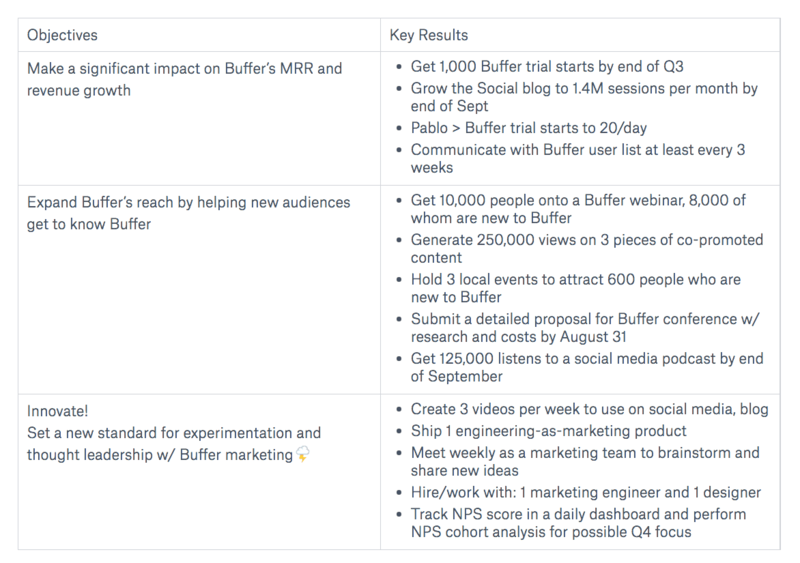 These are OKRs for the Buffer marketing team. On the left side, you can see how this can become difficult. In the first objective, Buffer’s marketing leaders can’t definitively say whether they have made a “significant impact”. After all, they could be using an entirely different marketing strategy that helps them grow 20% faster. That isn’t the point. If they can accomplish the key results on the right side, they are hypothesizing that they will hit their objective and see a large impact on revenue. There is one more important rule about setting up OKRs. Managers should only expect that their team will achieve 60-70% of key results, according to Google. If the achievement rate is higher, that means that the key results were too easy to accomplish. This also gives the team some flexibility. It acknowledges the fact that managers will not have a perfect estimate about reasonable key results at the beginning of the quarter. So, rather than expecting employees to work nights and weekends to achieve all key results, the team can refocus their efforts as the quarter continues to hit that 60-70% success rate. While OKRs start at the top of the organization, they give some flexibility for each team to decide on their own activities. If an organization wants to become a trusted name in the “CRM for small businesses” market, each department can decide how they will accomplish the key results related to that objective. 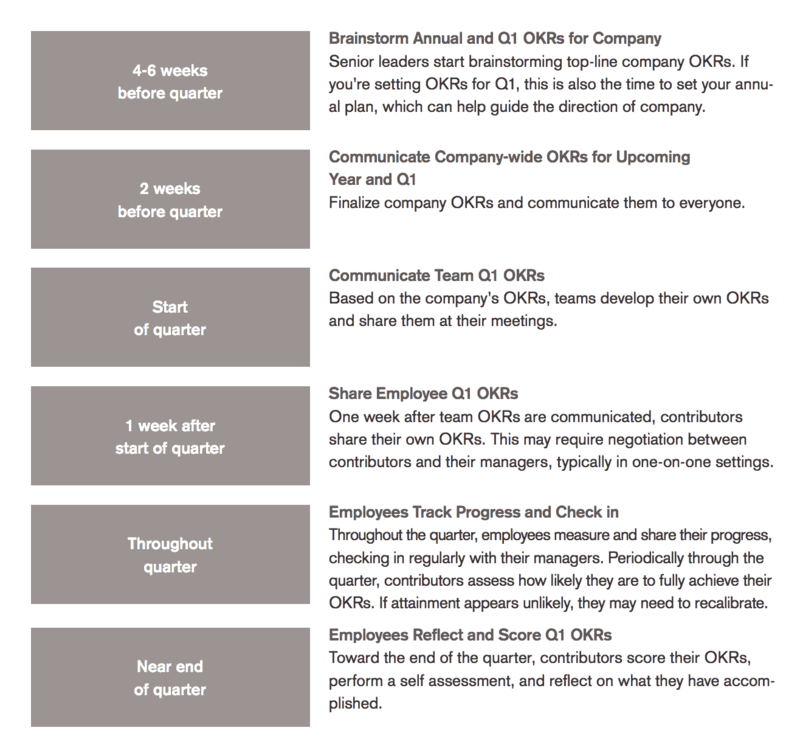 Here’s a chart that describes how OKRs travel down multiple levels of an organization each quarter. It is from the book “Measure What Matters” by John Doerr, the venture capitalist who helped Google implement OKRs. Each level of the company has 1-2 weeks to react to the OKRs set by the level above it. Even individual employees set OKRs at Google, although this is an agreement between the contributor and the manager. Each team does not seem to get any input on their own objectives. Their objectives were delegated by their boss. That means that the person who will be responsible for the OKR did not get any input while setting it up. The objectives are all quantitative since they are copies of a Key Result. There is no aspirational goal for all the individual teams, just a number. Here’s how you might be able to reorganize this. The head coach’s objective of winning a Super Bowl is binary. That means it is more suitable for being used as a Key Result. 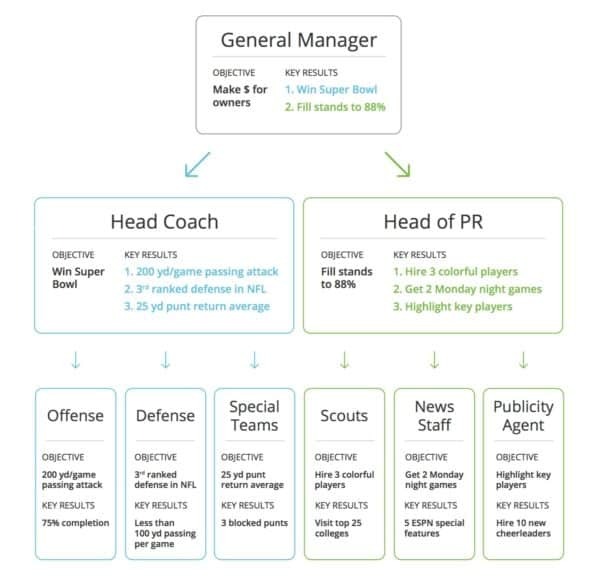 A better objective might be “Assemble the best all-around team in the NFL” using the three Key Results described. Compared to OKRs, KPIs are much more straightforward. They do not require each person to have an aspirational goal and connect it to specific results. Quick refresh–KPIs, or Key Performance Indicators, connect an individual metric to a general business goal. You would measure the rate of defects in final products as a KPI. You might be trying to go from 10% defects to 5% defects. And, since one KPI connects to one business goal, the outcome is binary. You either achieve your goal for the quarter or year, or you fail. There is no range of achievement compared to the OKR system. Also, KPIs do not focus on individual initiatives. Let’s say that you are a software engineer working at a payment processing software company. Your department’s goal is to reduce fraud from 2% to 1%. You are launching a new feature to make this possible. In the KPI system, there is no need to create a new objective for the project and an associated KPI. You are simply working on the department-wide KPI. That brings us to the last rule about OKRs that I haven’t shared yet. There are actually two types of OKRs–committed and aspirational. We have just covered aspirational OKRs so far. Committed OKRs require 100% achievement of the Key Results. You can use these Objectives for initiatives that are straightforward. For example, launching a new feature for a software product. Databox is a SaaS tool for small and medium-sized businesses. We have around 20 employees. 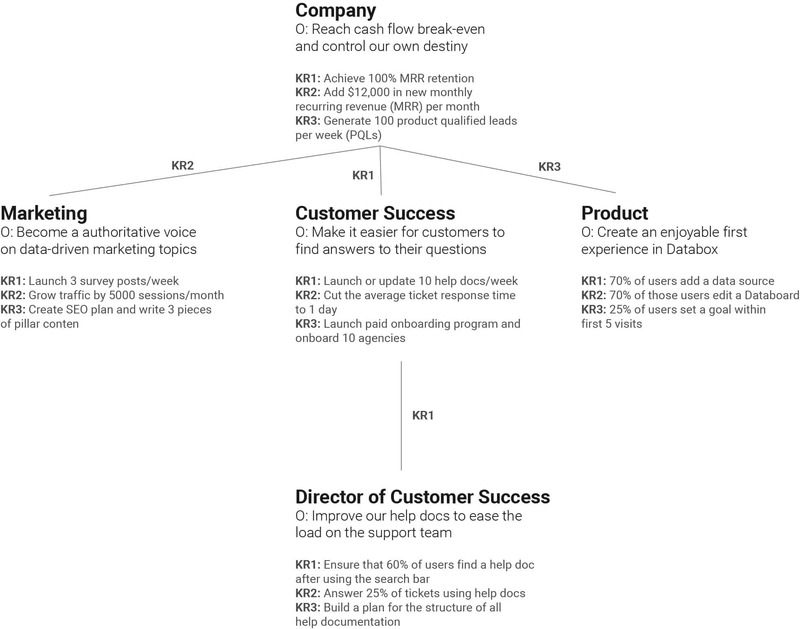 Here is how our OKRs might cascade through the organization for this quarter (Q3 2018). I am going to use 3 key results for each objective, but if we were a larger organization, I would use 5. I labeled the lines to show how each Objective connected to a Key Result on the level above it. Databox is a freemium SaaS product, which means we have plenty of happy users that do not pay us but could become paying customers one day. So, the customer success and product teams must focus on finding ways to help these users as much as possible before they talk to an actual human being. For each of the OKRs above, all 3 Key Results are certainly achievable, but since each team member has a limited amount of time, it is unlikely that any given team or employee will hit all 3. Fortunately, we should still have a chance to hit our objective if KRs are achieved 66% of the time (2 of 3). If you work at a company with less than 10 employees, the CEO or managing director will still be having personal conversations with each employee. Conversations about goals can be personal. But, if you have ever worked in an organization with more than 10 people, you probably know that a leader can’t announce a new initiative once and expect all employees to commit it to memory. In a larger organization, leaders need to make sure that their management principles are clear by referring to them in every company-wide meeting. That will remind managers that they need to follow suit with their employees. When it comes to OKRs, company leaders set quarterly Objectives and announce them to managers 1-2 weeks before the start of the quarter. Managers then have 1-2 weeks to set their own OKRs. By the time the quarterly company-wide meeting arrives, all managers already have their plans in place. Within the quarter, managers should check in on OKRs with their direct reports during every weekly meeting. You might think that this will put extra pressure on employees since they will be forced to think about their demanding goals every single day. Instead, this is why OKRs connect ambitious goals to high-level aspirations. Employees know that the meetings are centered around their team’s Objective, not a frivolous demand from a manager. Bob Ruffolo, CEO of IMPACT, implemented OKRs in 2016 after looking for ways to make IMPACT a top workplace in Connecticut. He began tracking all of the company’s OKRs in one central place and made sure every team knew how they were contributing to IMPACT’s success. He saw immediate results. You could use a Google Sheet to track all of this and make it transparent to members of your organization. But, that would require every team member to manually update their metrics each week. Whenever a teammate wants to see progress, they will see data that is up to a week old. If you run a sales, marketing, product or customer success team, you can track OKRs in real-time using Databox’s 60+ integrations, like HubSpot, Google Analytics, Jira, Mixpanel and more. First, you will need to create a free Databox account and synchronize your data source of choice. Then, head over to the Goals section using the top bar. Then add the name of the Objective. Then, after you have added all your Key Results and created tags based on objectives, you can sort by tag or by employee. Now, any employee will be able to quickly see the Objectives of other teams, and their progress towards those Objectives. 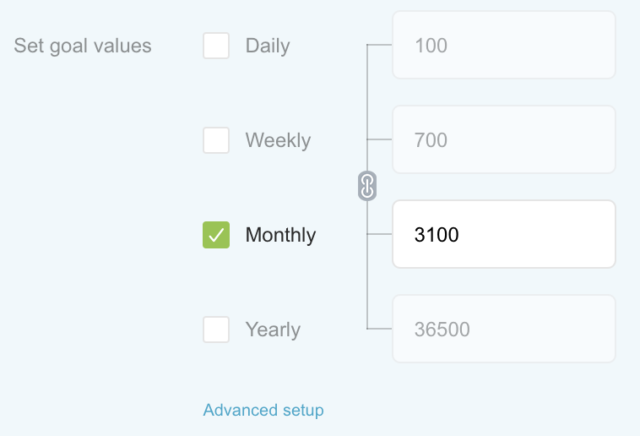 You can start tracking your OKRs with the Databox Goals tool after setting up your free account. Once you set them up, your progress towards Key Results will automatically update daily.